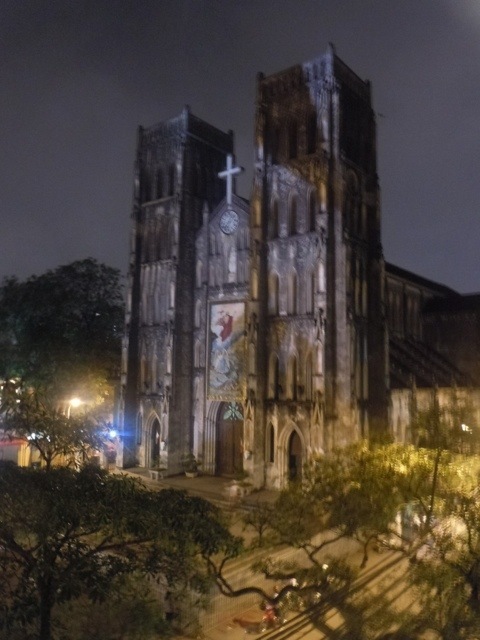 We arrived in Hanoi in the late morning and successfully navigated our way to our hotel, located in the Old Quarter of the city, not far from Hoan Kiem Lake. This is definitely the place to be: the streets of the Old Quarter curve and tangle into delightful alleyways that invite exploration at every turn. I assigned myself the role of “tour guide” and modified a walking tour of the Old Quarter to expose us to as much culture and architecture as possible. It wasn’t difficult. Just glance upwards and elaborate wrought iron railings are as common as debutantes at a ball and just as fancy. As properties were taxed by the width of the street frontages, “tube-houses” are common. These skinny buildings have multiple levels: the stores or shops are in front with the majority of living space stretching far behind. Communal Houses are eye-catching surprises, the elaborately carved doors, guardian dragons and Chinese lettering hinting at their histories. When wandering the Old Quarter, be sure to note the entire street name if you have a specific destination. 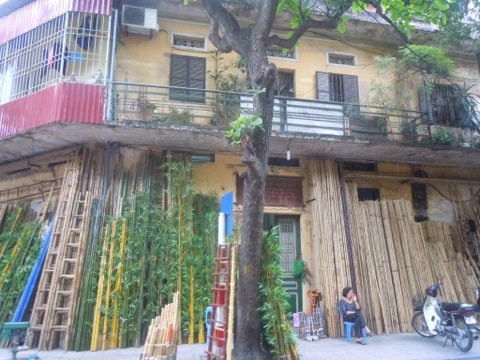 Most of the street names date back from the 1500s when the area was divided into guilds; hang means “merchandise,” so Hang Vai means, “street of fabrics” (it’s now home to bamboo ladders). There are a lot of “Hang”s, so it’s easy to get turned around. 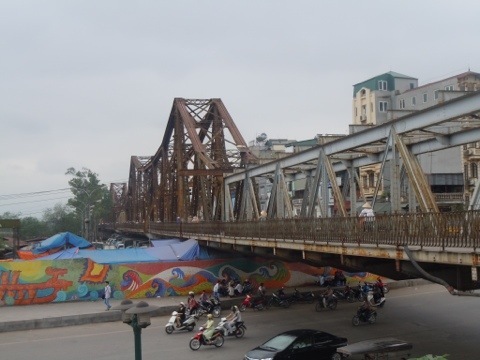 We deviated the tour a bit to get a look at Long Bien bridge, originally known as Paul Doumer bridge. 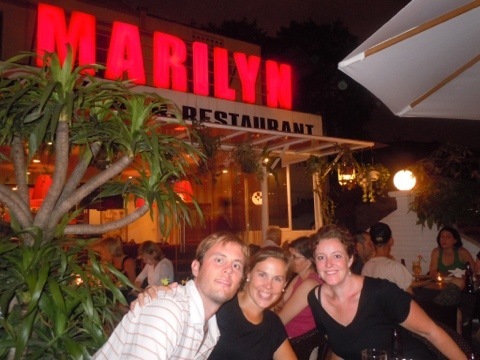 During the Vietnam War, this was one of the most strategic spots in Hanoi and one of its most heavily defended. Americans never managed to knock it out completely, but not for lack of trying. A friend of my mom’s actually spent a lot of time with this bridge in his sights as pilot in the Air Force. His memories of Vietnam are a lot different than what mine will be. He hasn’t been back; I doubt he ever will. As we walked to the bridge, an older Westerner and (I assume) his wife were sitting at a table in a sidewalk cafe, not speaking, looking over towards the bridge. They were still there after we finished our exploration. I wondered if he was lost in his own memories of Long Bien bridge. Then again, maybe the beer at 10 am was for another reason. We ended up staying in Hanoi a total of three different times, as Hanoi is the departure point for two very popular destinations: Halong Bay and Sa Pa. Halong Bay is a UNESCO World Heritage site (Vietnam is packed with them) and was recently named one of the “Seven Natural Wonders of the World.” Sa Pa is high in the mountainous north and is a popular base for visiting minority hill tribes and trekking. We decided to do both. For us, every road seemed to lead back to Hanoi. In my mind, that isn’t a bad thing, I like Hanoi, quite a bit. Yes, it’s crowded and there is a ton of traffic, but it follows the same crazy rules as traffic in the rest of Vietnam. Yes, there is a good chance that you’ll have a load of pineapples placed on your shoulder by a vendor lady trying to get you to take a picture and then pay her for the privilege of shouldering her load (pardon my pun), but now that you know that, you avoid it. I wriggled out of it quite quickly, but I saw it happen to other tourists. And yes, if you don’t watch where you’re stepping, there’s a good chance that one of those charming cobblestones will jump up and trip you. 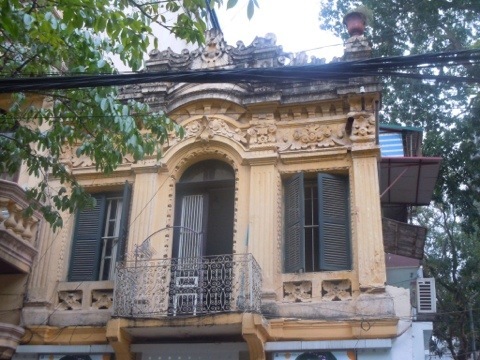 But Hanoi has charm and a history that oozes, sometimes literally, out of its rambling streets. There is plenty to explore and, if you simply get overwhelmed, there are plenty of cafes to pause and simply watch the folks go by. Trust me–there’s always something to see. Are you a runner? 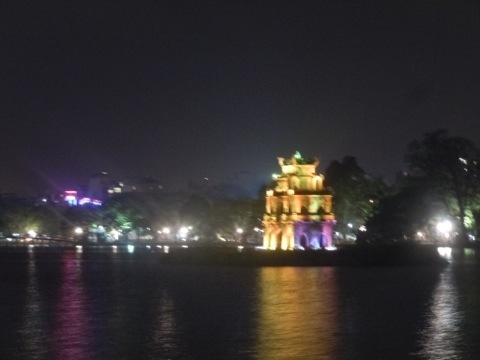 Check out Heather’s description of the Travelmeister’s morning run around Hoan Kiem Lake here! 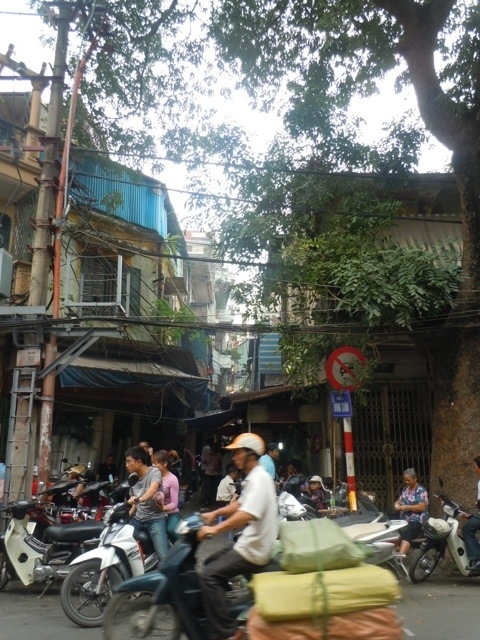 Tags: Hanoi, old quarter, tour, Vietnam. Bookmark the permalink. 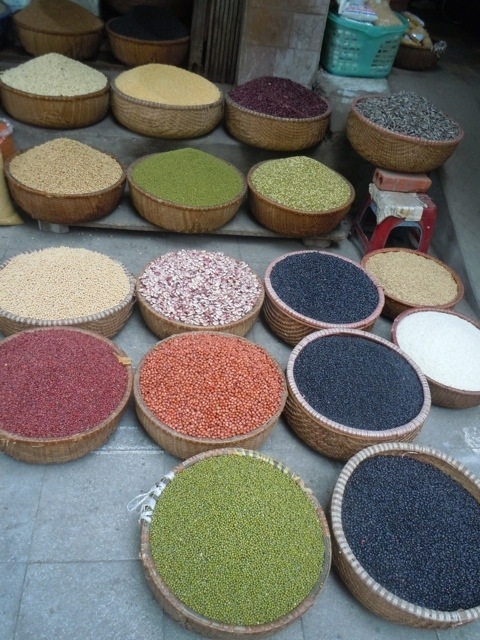 Previous post ← Hue, Vietnam: It’s a Festival!